It appears that a bloody purge is underway in North Korea to rid state organs of the cronies of eminence grise Jang Song-taek, who has been reportedly stripped of all his posts. Unification Minister Ryoo Kihl-jae told lawmakers here rumors that Jang's closest confidants Ri Yong-ha and Jang Su-gil were publicly executed in late November for damaging the Workers Party have been confirmed. Jang's brother-in-law, North Korean Ambassador to Cuba, Jon Yong-jin, is apparently set to return to Pyongyang via Beijing on Thursday. A diplomatic source in Beijing said Jon appears to have been recalled. Jang's nephew and Ambassador to Malaysia Jang Yong-chol has already been recalled. 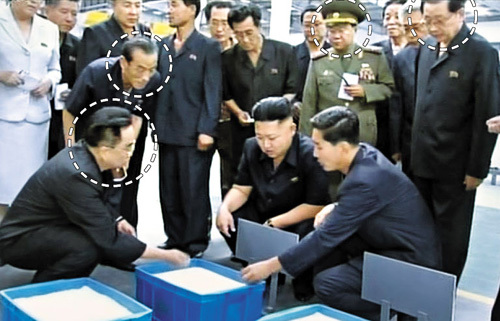 This screen capture from the [North] Korean Central TV shows Ri Yong-ha (front left) and Jang Su-gil, behind Ri, talk with Kim Jong-un at a factory near the Taedong River on Sept. 2, 2012. Jang Song-taek is at back right. The Unification Minister said no harm appears to have come to Jang himself, though his whereabouts are a mystery. In a closed-door meeting later in the day, Ryoo said it should be remembered that Jang survived three purges in the past, only to return to a new position of power. Meanwhile, North Korean leader Kim Jong-un is apparently away from Pyongyang, judging by a sighting of his personal train, a government official here said Wednesday.